Map courtesy of Walkhighlands, OpenStreetMap contributors, and Ordnance Survey data © Crown copyright and database right, 2011. The Syndicate fishes the larger of the estate lakes, known as The House Lake. Entry is via the Arboretum (at SE 258 851, but well sign-posted from the Masham road). All visits are to be recorded in the fishing book, which is kept in the box located in the wood between the Boat House and Pavilion. The box can be slighly challenging to find if it is your first visit, but if you walk towards the lake on the track that runs inside the wood from the car park at the back of the pavilion, and then follow the curve of the track around as it nears the top of the lake, the box is beside a tree located a few yards from the road to the house, near the place where the track broadens out. Car parking should be to the rear of the Cricket Pavilion and members may take their lunch on the decking of the pavilion, provided that they leave the place tidy on their departure. The pavilion is hidden away amongst the trees about half way down on the right of the track that leads from the gate at the far end of the public car park to the house. Ignore the first track on the right immediately after you go through the gate and take the second track, turning left when you reach the fence at the edge of the wood. The pavilion is on your right about a hundred yards down this track. if you reach the lake, you have gone too far and need to turn back. The track to the pavilion is suitable for two wheel drive vehicles as long as the ground is reasonably dry, but beware that some of the turns are tight and that vegetation overhangs the track in places. The pavilion is, as you can see, rather fine, and we are extremely lucky to be able to use it. Just please remember to leave it as you found it. Members may not fish from the lawns on the side of the lake in front of the hall, but it is permissable to walk around the eastern end of the lake and fish on the part of the northern shoreline which is down to pasture, which comprises the easternmost two-thirds of that shore. The limit is fairly obvious, as the lawn has a fence running down one side to keep the stock out. 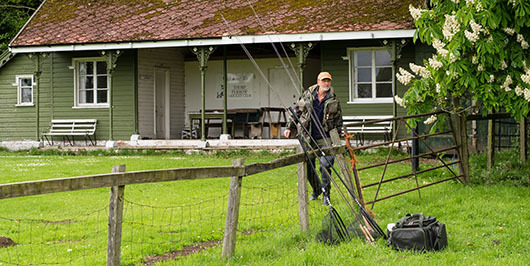 Four rods are permitted on the House Lake. The fishing at Thorp Perrow is somewhat constrained by the overgrowth of weed at the moment and the central section of this very attractive piece of water is unfishable because of this problem. Do not give up however, as there is excellent fishing available on this lake if you know where - drop into the forum and the Thorp Perrow fans will let you in to the secret. The lake can give very good sport indeed on buzzer and even provides sight nymphing, should conditions be right - one of the great advantages of the lake being that it can fish well even in the extremely bright and calm conditions shown in the photograph below. A caravan rally is held annually at the Thorp Perrow Estate. The Estate Rod tickets are made available to persons attending such rally, subject always to compliance with these Rules of the Syndicate. Sir John Ropner holds annually one or two special events in the Thorp Perrow grounds, including clay-pigeon shooting and similar activities. Members should not commence or continue fishing during such events, but should immediately leave the Estate. 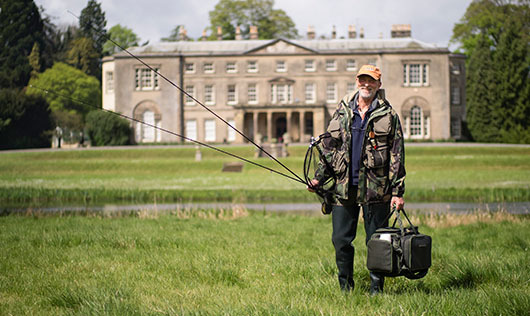 Guests of riparian owner are permitted to fish from the house banks at Thorp Perrow Hall. All persons so entitled will carry a membership card endorsed 'Estate Rod'.